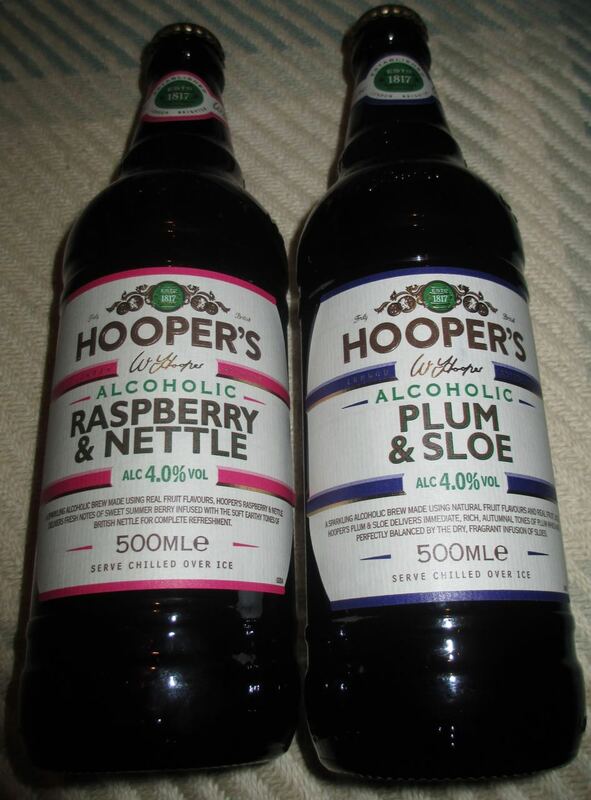 I’ve recently blogged about the much-enjoyed Hooper's Alcoholic Dandelion & Burdock before and always fondly remember the Alcohopop fever that was Hooper’s Hooch in the nineties. Of course I was trying to look tough at the time smoking and drinking crates of beer. I haven’t smoked for many a year (over 17 years now), but I still do like my odd beer now and then, as my belly will attest to. Here we have two new flavours from Hooper’s that they very kindly sent to me. This is a curious sounding brew indeed and in good time for a change in the weather. Today has been a little brighter and a little warmer. This 4% volume Raspberry & Nettle is Hooper’s summer brew with real fruit flavours of raspberry infused with British nettle. I’ve tasted nettle tea before and enjoyed it, so I can’t harp on about how much I’d be worried about the added odd ingredient. Besides, when you think about, even though it’s a traditional drink going back beyond time remembered, Dandelion & Burdock should sound pretty weird and it’s just not. Nettle… pah! Bring it on. Besides on opening the bottle the heady aroma of raspberries hit my nose like a runaway mine train. Bam… RASPBERRIES!!! My nose felt a bit sorry for the nettles. Then I remembered my childhood of frequently falling off my bike or tripping playing football or whatever and there always seemed to be nettles there. Even though there didn’t seem to be any nettles there moments before! If there is a smell of summer that springs to mind it’s got to be raspberries and there was oodles of it coming from the fizzy red liquid that was filling my beer glass. However, the sheer explosion of raspberries that my tastebuds were expecting on first gulp didn’t knock me off my feet… and thankfully so. Sometimes the problem with a brew such as this is that it can dangerously taste like a child’s fizzy pop drink. This was not the case here. This was a much more complex blend of flavours. Yes, there was a strong hit of raspberry to start with, but that blended very quickly indeed with an almost earthy taste of nettles. The raspberry flavour came back moving into the aftertaste, but the nettles insisted on following and would not be overshadowed. Good on those pesky nettles I say, even though my palms, elbows and knees still haven’t forgiven them! Okay I have to rather embarrassingly admit that I hadn’t heard of sloe. It is a fruit that apparently tastes a little dry and fragrant, which should probably calm down the blast from the plum. So the label hasn’t been spelt wrongly and I don’t have to drink this 4% alcoholic plum drink in slow motion. I would look sloe up to see what one looks like, but my broadband isn’t exactly quick at the moment. I’m sure it’s not a coincidence and the label is spelt correctly! There was the pleasant pop and fizz on opening the bottle that I’d experienced with the Raspberry & Nettle. This deep red brew smelt of plum mixed with something… I just couldn’t put my finger on what it was… Okay, okay… so it was probably the sloe, whatever the heck that is! On first fizzy taste it was like pinball wizard on my tastebuds as the iron ball bounced off every flavour. Pull head back… Ping! Plum… what was that…? Plum… what was that…? You get the picture. In the aftertaste I got the prize I just don’t know what happened on the bouncing journey, but be prepared for this autumnal drink, because it’s certainly not boring. It was a joyride of flavours and no mistake. Fizz… Ping… Plum… what was…?